consumers should be provided with the highest standard of information for alcohol beverages on menus for chain restaurants and other similar dining establishments. These company-members produce more than 81% of the volume of beer sold in the United States. Thus, buried deep within its letter to the FDA, the Beer Institute, by inference, makes common cause with its member Goliaths versus 'craft' brewery Davids. Only very rarely, the BI supports disclosure of a single calorie reference for a category or group of beverages alcohol products, provided all products have the exact same nutritional values for each serving size provided to the consumer. This would only be acceptable in instances when this disclosure provides the consumer with the maximum amount of information. But we wish to reiterate our opposition to the use of a single, limited disclosure based on averages for all beer, wine, or drinks made with distilled spirits. The large brewing companies and conglomerates which comprise the BI have the financial wherewithal to pay for lab analyses and label changes. Requiring smaller breweries to provide this information could be onerous: the cost of analysis for each and every beer could be beyond their means. The FDA, showing small-business beneficence, however, will offer relief. If a specific type of wine, beer or distilled spirit offered for sale in a restaurant matches the description of the type of beer (wine or spirit) in the USDA database, that generic nutritional information can be used. And the effect upon Mom & Pop, single-site, and small-chain restaurants? The mandate would apply only to restaurant chains with more than 20 locations. Appleby's has the cash. Businesses have until July 2018 (or July 2019 for businesses of less than $10 million in annual sales) to bring their Nutrition and Supplement Facts labels into compliance. In light of the FDA regulations, it's interesting to recall that a quarter-of-a-century ago, in 1992, 'craft' beer pioneer Bert Grant voluntarily (others would say provocatively) put nutritional information on the label of his Grant's Scottish Ale. But, back then, the U.S. government told him to immediately cease and desist. 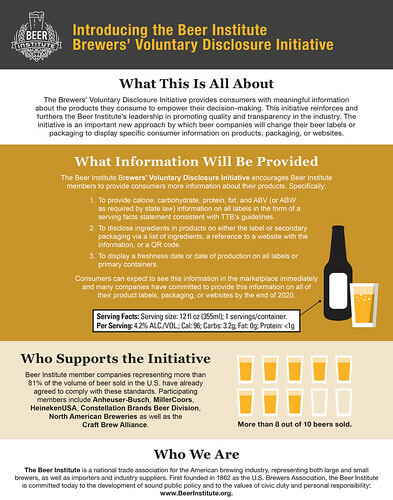 Going further, the Beer Institute, in 2016, created, what it called, the Brewers’ Voluntary Disclosure Initiative. calories, carbohydrates, protein, fat, freshness dating; and alcohol by volume (ABV) on all labels in the form of a serving facts statement, and disclose ingredients in products on either the label or secondary packaging via a list of ingredients, a reference to a website or a QR code. Again, easy for the big boys; difficult for the little guys. But you know what? 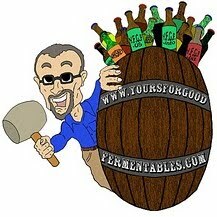 As a beer consumer, I'd welcome transparency and honesty from the 'craft' breweries about their beers. Especially concerning the freshness of their beer or lack thereof. And make this declaration easy to see; easy to decipher. And I'd like to see that on both the can or bottle and on the carton. 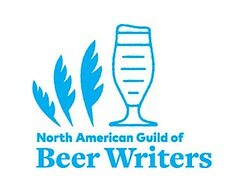 The Beer Institute's press release. More about the BI's Voluntary Disclosure Iniative. The FDA nutrition-label rules: here.